517 creations: 12 in 12...january's reveal! My 12 in 12 project for January was to tackle the playroom and I'm excited to reveal the shelves that my husband and I built! 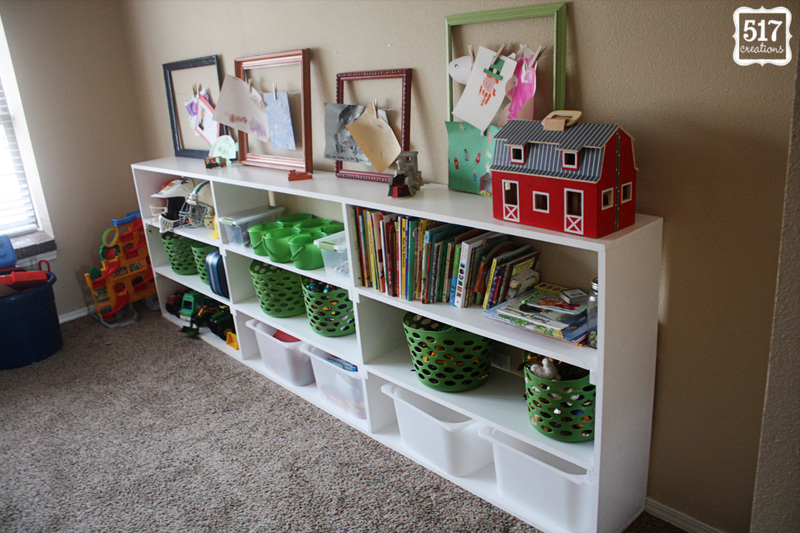 We used my inspiration shelves as a jumping off point and built these to fit the play room and fit our needs. The shelves are made out of 1 x 12 pine (be careful when you're buying wood because the wood doesn't actually measure 12 inches wide!) which we had cut to size at Lowe's and screwed together with wood screws. We used cleats to hold the shelves in place, which are just 1x2s cut to size and screwed into the sides. The shelves are then attached to the top of the cleat. After all of the construction was complete, I sanded everything down and filled the knots, holes, and imperfections with wood fillers. The edges were all caulked and then I painted 4, yes FOUR, coats of white semi-gloss paint. I just used Valspar's white semi-gloss paint off of the shelf and loved it! We attached 2 more 1x2s to the back of the shelf and screwed that into the studs to secure the book shelf to the wall. It's not going anywhere! 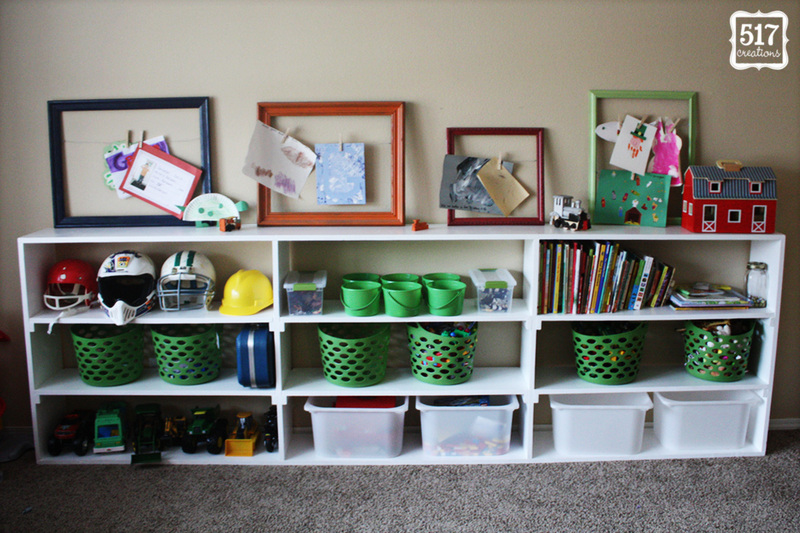 I added the green baskets (from the Dollar Tree) that were on the previous shelves in the playroom, along with the new bins that I bought at IKEA. I'd like to get 2 more of the white bins to put along the bottom shelf and 3 more green baskets to fill in the middle shelves. I have a few more projects up my sleeve to "decorate" it a little more, including adding a few more frames to the wall for Grayson's art. The 4 frames are just leaning for now but will get hung back up in the near future. I think that Scott and I did a pretty good job for it being the first piece of furniture we have built together! If you have any questions about specifics on the book shelves, feel free to leave a comment! I will be back tomorrow with February's 12 in 12 project! Have you ever built a piece of furniture with your husband or by yourself? What are your secrets? Nice job!!! :) I really enjoy your blog! Looks great!! 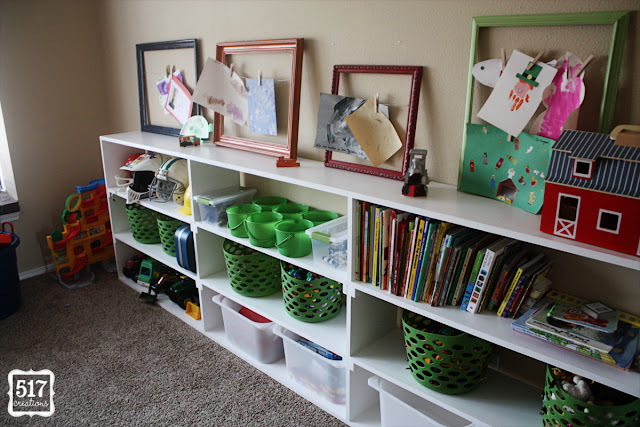 I bet your shelves are much sturdier than any you could have bought! Love the open frames for artwork. Can't wait to see what's next! 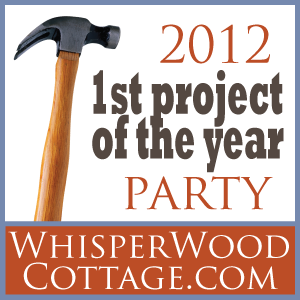 Looks totally cute-- can't wait to see it in person!!! Way to go Smiths! You guys did a great job! And hooray for cute organization! They look great. I love all of the green! Did y'all have to saw the wood yourself, or did Lowes just cut the pieces for your while you were there, and you just screwed them together when you got home? I need to build some shelves just like these for our playroom, so just wondering what all I would need! They look great, and I'm enjoying your blog!